We specialize in opener repair service. Whether you are looking to install a new garage door opener or to repair your existing one, experienced contractors are here to help you. We have a wide selection of professional grade, residential garage door operators for smart home, high performance, quiet operation and reliability. Price: More often it is cheaper to repair a malfunctioning opener than to buy a new one. Age: If your motor is really old, you might want to change it. Newer models come with more safety features and improved technology for quieter performance and more. Safety Sensors: After 1993 openers are required to have an automatic safety reversing system. What this does is, when something or someone, like a child, is under a closing garage door, between the sensors, these will tell the motor to stop the door immediately and reverse it. If your opener is more than 24 years old, chances are that it might not comply with the current laws and it is a good idea to replace it. Give us a call! We will be glad to help you make the right decision. Or if you want us to make the necessary repairs, we’ll schedule you an appointment right away. Chain drive: This is the most simple and generally cheaper option. Screw drive: Often times a better option than Chain drives. Screw drive openers cost a little bit more than most chain drives. In general, they require a little less maintenance than most chain drive motors. Belt drive: If you are looking for a quieter opener, you need a belt drive. They are the quietest but they can cost a little more and don’t require much maintenance. Size of your door and what is it made of. The bigger and heavier your door is, the more horsepower motor you will need. How important, for you, is the noise caused by the opener? Some openers are quieter than others. If you have a room above or near your garage you will want a quieter motor. Do you want to monitor and open your garage door with your smart phone? Many motors like Chamberlain’s MyQ Smartphone control garage door openers with built-in Wi-Fi allow you to control your garage door using your phone. These types of openers connect directly to your home’s Wi-Fi network to provide you smartphone control. Is you garage door used more than the main entrance of your home? You will need an opener with more horsepower if you use your door frequently. Do you have power outages? 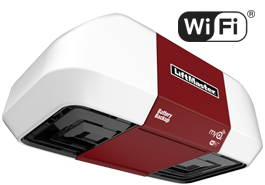 An opener like Liftmaster’s DC motor with Battery Back up lets you use your garage door when the power is out.